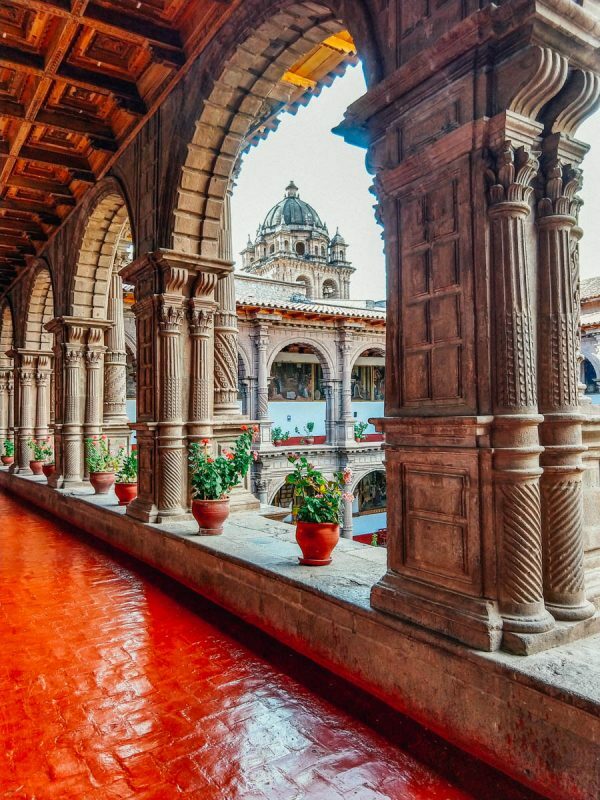 If you are looking for things to do in Cusco while acclimatizing to the elevation, you can check out some of the beautiful ornate old buildings. One of these is the Minor Basilica de la Merced, an old church and convent in Cusco located just one block away from Plaza de Armas. On a sunny day, we decided to check out this basilica and found it to be quite an interesting place. For a few surprising reasons as you’ll see. Before you enter, there’s this massive turquoise door that is beautiful against the neutral tones of the rest of the facade. 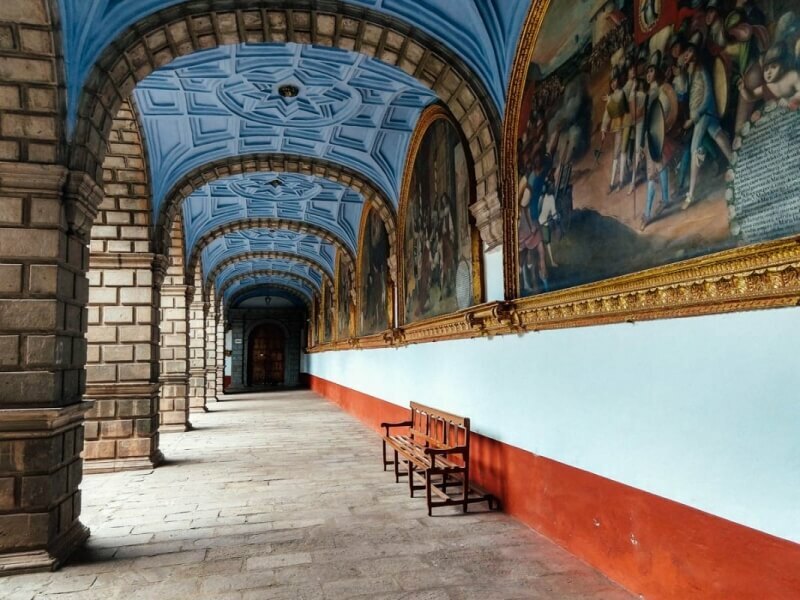 The Basilica and Convent of Merced is a building in the old spanish style surrounding a courtyard inside. You visit the rooms along the cloisters, to see various artworks but you’re not supposed to shoot in the rooms, despite the entrance fee. Although quite small, S/10 or $2 USD, this is in fact a church and should be free to enter. Frankly, I find the no photography rule a bit tiring, even though I rarely want to shoot artifacts in museums, I just feel guilty carrying my camera. But, I also abide by such rules, so I didn’t shoot the art in the rooms. The building itself has beautiful architecture and murals so there are some eye-catching pathways to shoot. Search for great colors and lines to find and frame your shot. You should definitely go take a look at the Custodia of Merced. This 22kg gold ornament is encrusted with thousands of diamonds and rubies, and the second largest pearl in the world which is in the shape of a woman’s bust and belly. It was a bit surprising to find this incredibly precious item here somewhat unassumingly placed. I wish there were some descriptions of the art, the artists and their significance. I really like to learn something when I visit a place like this, don’t you? And it was admittedly hard without any information. For example, we noticed a painting of the Virgin Mary, breastfeeding baby Jesus and an old man! It was more than a little strange. I learned later it’s a painting by a famous artist Ignacio Chacón, and the old man is San Pedro de Nolasco, who founded the Mercedarian Order. Still strange, but at least some context to go with the image. Don’t miss the small set of stairs in the corner of the cloister, that go down to below floor level. Inside are two tiny adjoining rooms covered in murals, one of which was frankly unnerving. They seemed to depict heaven and hell, and the hell room is pretty scary. The claustrophobic nature of the rooms made you wonder what went on in there. Turns out it’s the cell of a Father Francisco Salamanca, but still no idea why he was in a cell. We quickly escaped back to the sunny courtyard, that seemed quite at odds with those dark hidden rooms. I liked how there were quite a few plants around adding a bright pop of green here and there, against the beautifully carved Corinthian columns. Another great pop of color comes from the vibrant red floors all around the second floor. I was only carrying my phone at the time so it was interesting stretching the capabilities of the phone to handle the combination of shade and sun. This combo can be very challenging with the small dynamic range of the phone. Have you ever taken a shot like that an either had the sunny areas disappear into bright white? Or the shaded areas become solid black? That is due to the inability of some cameras to handle the *range* of light from dark to bright. In this sort of situation, use HDR and change the exposure on your phone until neither the sunny parts get blown out, nor the shady parts go black. Then edit to bring out the shadows to somewhat approximate what you saw. Obviously with the higher dynamic range of a real camera, you will have an easier time capturing such scenes. The art in the Basilica has a heavy lean toward the fire and brimstone brand of Catholicism that came with the crusades and Inquisition. There are a lot of images and statues depicting torture, which I really am not a fan of. But apparently the Mercerdarian Order was all about paying ransom to save Christian captives, so maybe they were motivating their priests with the thought of saving these people. Finally there is an actual worship space or traditional Church that is only open for a couple of hours a day. It happened to be open while we were there so we got to enter. When shooting a space like this, you really need a wide lens to get it all in so don’t forget to carry one. If HDR is an option on your device that can again help with the tonality of the image. Wide angle lenses are useful to capture a scenes that are bigger than what you normally can see in your camera or phone. They can also bring the viewer into the image. Check out these recommendations below. In terms of photography, this is a decent spot to get some alone time with old Spanish architecture. The Minor Basilica de la Merced has some interesting history but you’d probably need to read up before you go. There are restrictions on photography as I mentioned, but I don’t usually want to shoot items I see in a museum so for the most part that was okay. Another real advantage is that, in the touristy vendor-filled bustle of this city, this is one of the few Cusco highlights that is quiet and lets you peruse and shoot at your leisure.